The rules are simple enough, build a Special Operations Group of between 5 and 20 models from your codex pursuant to the rules restrictions set forth in the special supplements. You can then add in some special bonus equipment, skills, and abilities for your army. They are pretty straight forward and fairly simple modifications of the standard Warhammer 40K rules. I'm certain that the writer of the rules will be glad you download them as they are well written, clear for the most part, and make for some really fun and fast paced games in my experience. You can complete a game in about an hour to an hour and a half, which is quite good given the parameters. Still, the games are challenging as well as fairly fast paced. In our little tournament we are giving away prizes for the best painted squad, best written storyline, best commander, worst luck, and a few other things. It is all in fun, but the store is giving away prizes, so it should make for some fun gaming and challenging judging for the tournament judges. So, sorry for this late post - I've missed one weekend and I regret it, but work comes first and I was very busy on preparing for hearings all last weekend in court. So, in that regard, my weekend was a success, confession was not suppressed, motion to exclude the defendant's expert was granted, and I was not sanctioned for failing to provide any discovery to the defense counsel. Now, back to the fun part of this whole post: Gaming! I have begun raising my own Imperial Guard regiment, the 1st Imperial Guard Grenadiers from the planet New France, and their recruiting grounds, the hive city of New Paris which looks coincidentally a lot like the Eifel Tower, only much, much larger! The 1st Imperial Guard Grenadiers are the elite regiment from New France, together with the rest of the regiments of the Governor's Imperial Guard Corp, they are the backbone of the defense of their sector. New France is mainly an agricultural world with the sole hive city of New Paris dominating the central continent of the planet. 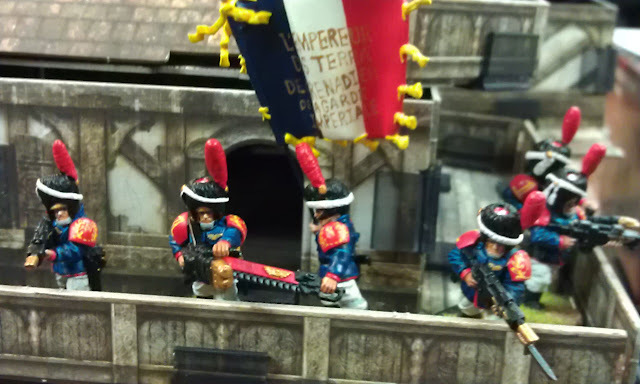 Membership in the elite 1st Imperial Guard Grenadiers is limited to those who have survived and not only survived, but excelled in a prior regiment within the New France Imperial Guard Corp. In order to make my Imperial Guard different from anyone else's that I know, I have gone about modifying them with special headgear, the Bearskin helmet. I have taken a few photos of the first elements painted up for this scheme for your viewing pleasure. Below, is a short story I wrote while slightly inspired (read intoxicated) while preparing for the coming weekends events. I hope you enjoy! Colonel Valois was tired from the campaigning. His special operations group had been marching for what seemed like three weeks straight with little rest and the troops had been subsisting on MRE meals and foraging for the past ten days. The men were tired, hungry, and itching to find something, anything to do besides march in column down the road toward their objective, an outpost, which had failed to report in, and subsequent attempts to contact had gone unanswered. Attempts to get a transport section to the outpost had met with no results, either the vehicles sent were not worthy of making the 180 mile trek through narrow jungle roads, or the Administratum had sent defective airframes which had been slated for complete overhaul, not front line combat reconnaissance. After 5 days of attempting to contact the outpost or obtain appropriate transports, Colonel Valois was left with but one option, take command of a special operations group and hoof it through the jungle with a heavy radio set with would allow constant contact with his base and hopefully they would be able to get the “Cavalry” in to assist them in short order should things not be what he suspected, which was a faulty radio set and no supplies to effect a field repair. Thus, Colonel Valois set forth with 9 men from his elite 1st Grenadier Guards regiment, chosen for their tenacity, marching prowess, and most importantly for their marksmanship and fighting attributes. 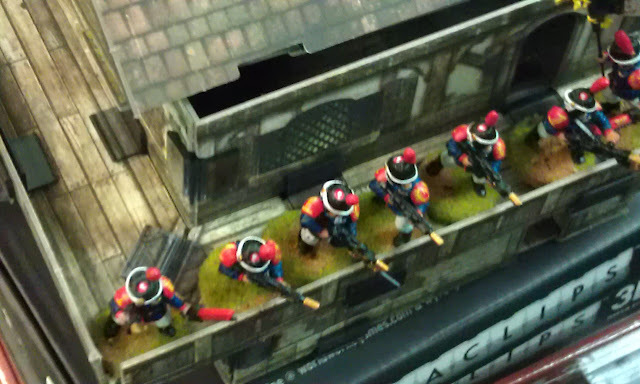 Some had boasted that the 1st Imperial Guard Grenadiers were a match for any Space Marine chapter in ferocity in combat, only as usual they were denied the best equipment due to lack of resources. The population of New France had gone to great lengths to insure that the best of their forces were equipped with the most recently issued equipment, but were dressed in their generations old and honoured traditional dress uniforms of deep blue coats with red cuffs, and the honoured Bearskin helmet with plumes and cords, a tradition which ran back to the earliest days on Terra. Thus equipped, they had fought in the forefront of nearly every battle in the sector as the rock at the center of the Imperial Guards attacks and stalwart in the defense of a thousand bastions over the past millennium. Colonel Valois was proud to be a member of the guard, and more proud that his leadership had resulted in the capture of over a dozen enemy standards in his 35 year career with the 1st Imperial Guard Grenadiers. 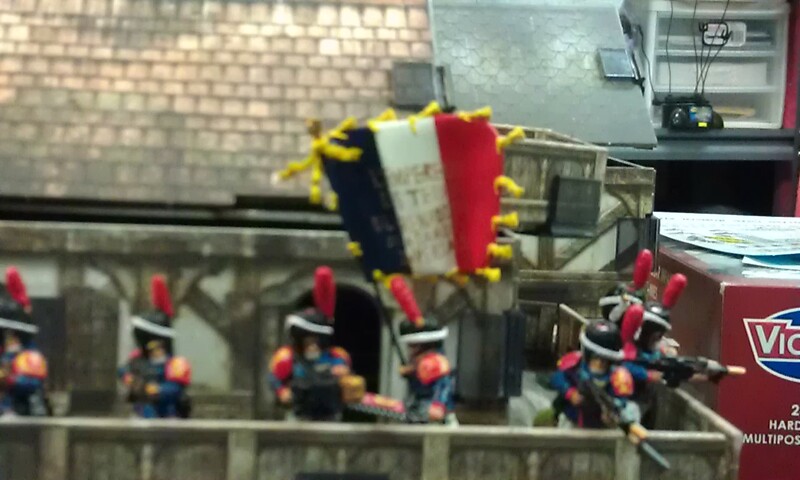 Among the newest members selected from the New France 1st Imperial Guard he was known as “les Gronard” for his methods of determining who was and who was not worthy of service in the Guard Grenadiers. Many who thought they were worthy, were found wanting under his eye, and were rejected, only to be snatched up for service in the 1st Imperial Guard Chasseurs la’Pied, their regimental combat companions and competitors. The competition between the units had been continuous for the past 500 years with each regiment seeking to bestow glory upon the Emperor with their deeds and martial prowess. However, for this mission, the task had fallen upon the 1st Imperial Guard Grenadiers, for they were closest to the listening outpost and they were the most trusted regiment in this campaign. Their orders were simple, send a unit forward to ascertain why they had not heard from the listening outpost and report back. Colonel Valois knew deep down in his heart that this was not an ordinary mission just by the wording of the communiqué from the High Lord Marshal John Henrie Davout. This mission was a “suicide mission” and had the words all but written all over the front page of the communiqué. No commander had ever issued an order for an infantry regiment to undertake a simple reconnaissance mission to ascertain the fate of 5 other soldiers who had been manning a listening outpost. The mission was one where you would simply send forward a patrol of cavalry or an airdropped platoon to reconnoiter the listening outpost and report back their fate swiftly. No commander would send orders down to the premier infantry regiment in the Segmentum for them to send forward a select group to “make contact with the listening outpost and report back” and to do it within three weeks when the listening outpost was over 180 miles away through dense jungle terrain with narrow jungle trails and a blistering hot desert on foot. Something big was up, and Colonel Valois knew it, and he knew that sending forward a simple patrol, or skirmishing party would not be sufficient for the task. The orders had been relatively brief, lacked anything other than the command that he send forward a party to ascertain the fate of the listening outpost. Colonel Valois had considered bringing the entire regiment with him on a double-time march, to bring the greatest amount of firepower with him as possible without compromising security in his sector. Why had they stationed the 1st Imperial Guard Grenadiers in this sector of the front in the first instance he had known was problematic since his regiment set foot on the planet Krasnoyarsk II. There was a sector of the front, which was extremely active, full of battles, tank assaults, bastions to breach, and regimental colors of the enemy to capture, however, they were not stationed there. They had been sent to an isolated outpost in the southern sector surrounding the industrial city of Schtahlnogorsk, one of the major manufacturing cities on Krasnoyarsk II. Certainly not a duty for a front-line combat regiment – garrison duty in a manufacturing city on a seaport town in the southern sector, miles away from the front. In the battle for control over Krasnoyarsk II, it appeared that the 1st Imperial Guard Grenadiers were destined to sit by idly and watch while the 1st Chasseurs la Pied captured standards, broke the enemy front and gained well deserved glory for their actions, all the while his regiment sat in garrison. When he was first informed of his placement three months ago, he complained directly to the Commissar Colonel Napoleon Corvina, that his regiment should have the honor of being stationed in the center of the front on the most dangerous tasks to insure swift victory over their enemies! However, he had been swiftly silenced with a glance from the steel eyes of Napoleon, before being given orders to set off at once and secure the city. Colonel Valois begrudgingly had ordered his regiment to double time to Schahlnogorsk and they had swiftly covered the march from the starport at Neu Moscva establishing a secure corridor along the way. Thus far between Neu Moscva and Schtahlnogorsk, there had been virtually no enemy activities with the few exceptions of isolated “terrorist” style attacks where insurgents had blown up a vehicle in a building after hijacking the vehicle used in the attack. All of the incidents had been quickly and brutally suppressed and the loss of life in the sector had been 35 soldiers, and half of them were due to recreational activities while they were on leave. None of the 1st Imperial Guard Grenadiers had been stationed on a jungle world, they had been trained on a variety of jungle worlds, ice planets, volcanic mining planets, even an asteroid belt campaign against Dark Eldar pirates intent on preventing Alcoa Imperial Mining Corporation from stripping the valuable ores located in the asteroid belt of the Benlavai system. Training was different than being stationed in a quiet sector and having time to release men for recreational activities, recreation for the 1st Imperial Guard Grenadiers was a luxury which was seldom allowed, and the men “lived it up” so to speak, by engaging in the most dangerous activities possible rather than lounging around. Thus, of the terrorist incidents, only a dozen soldiers had been killed while the others had died in risky activities such as cliff-diving of the Schtahlnogorsk Massif, a series of high cliffs on the edge of the city which gave one a majestic view of the port and the industrial city. Others had died in dueling with the locals, and after winning had the unfortunate thought to demand that the loser pay his gambling debts on the outcome of the duel, only to be knifed in an alley way along with his companions by the organized crime racket of Schtahlnogorsk. Colonel Valois knew that these losses, while annoying, were of minor consequence given that under his command they had suffered more losses in a single day of combat breaching a bunker in the Benlavai system. Colonel Valois had secured the corridor and the city in record time; Commisar Colonel Corvina had as much as stated such to the High Lords of Terra and the Governor of New France in his dispatches. Colonel Valois took pride in the fact that even in relatively simple duties he and his regiment were mentioned in the dispatches home to his father-in-law, Governor Massena, of New France. Once he had secured the city of Schahlnogorsk, he set about setting up security to Neu Moskva including several isolated listening posts stationed at regular intervals along the corridor and around the bastions at Schtahlnogorsk. 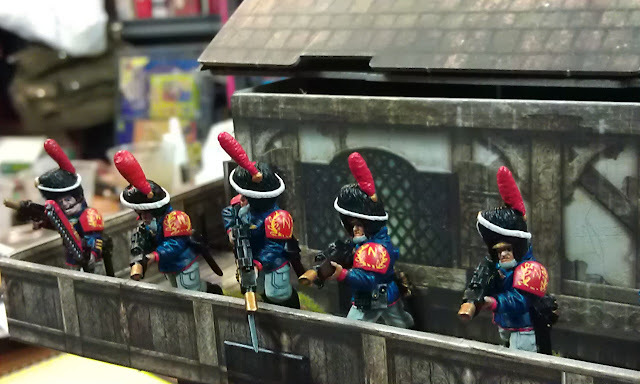 The 1st Imperial Guard Grenadier Engineering Company had gone about the business with their usual aplomb and had created an inter-woven curtain of defenses the likes of which even the much-lauded General Vauban during the ancien regime on Terra would have envied! The inter-locking fields of fire were such that at least one Mitrailleuse or lascannon of his regiment covered every square inch of the front and corridor between Neu Moskva and Schtahlnogorsk. The Empress Dragoons with their armored might had used the corridor constantly to move supplies from the port of Schtahlnogorsk to the front, and their commander, Colonel Starviski had praised the 1st Guard Grenadiers for their work on improving the roadways and protecting his convoys during the three months they had been stationed. Thus, with this backdrop, Colonel Valois knew that the new orders from Commissar Colonel Corvina were unusual, if not down right heretical given the nature of the past three months duties. Colonel Valois knew that something big was a foot, he just knew it. All attempts to ascertain the nature of the problem had found nothing, nothing which raised any alarms. No dispatches from the front gave any insight into the enemies activities, and none of the listening posts reports provided any clue as to the enemies movements. Even with the single and isolated outpost at Mount Kurskova failing to report in as scheduled had been scoured without any clues as to why such a mission had been ordered. Colonel Valois contacted the astropaths at Neu Moskva and asked them to provide orbital data and scans of the area to plan his mission, their response, while voluminous, had provided little data that he did not already possess. The 1st was just going to have to do as ordered and in the process hopefully they would find the reasons and they would survive. Colonel Valois knew that he could not send others on a mission that by all intents and purposes was a suicide mission without giving them an opportunity to volunteer first. Colonel Valois summoned his officers into his command post and briefed them of the situation. He informed his subordinates of the nature of the mission and all of them agreed that the instructions were to simplistic to mean anything other than something terrible had gone wrong. Colonel Valois asked his subordinates who would be willing to go on a guaranteed suicide mission across 180 miles of jungle and deserts to check on a remote listening post with little to no guarantee that any back up force or relief would be forth-coming. All of them volunteered to go, to a man, for they knew that their Colonel would lead the mission himself, for he would countenance no man doing anything that he himself was not willing to do. Pierre Valois looked at the faces of his trusted junior officers, Lieutenant Colonel Louis Lannes was covered with a grimace and pain knowing that he would not be permitted to participate as he would be the remaining commander in charge of the regiment. Major Allehandro De la Cruz brow was furrowed as he studied the data again and again attempting to glean some meaningful insight into the mission that might have been overlooked without apparent success as he closed his eyes and wiped a tear from the corner of his eyes. Major De la Cruz was one of the bravest men and knew that he too, would be denied permission to participate in this mission. The rest of the officers bowed their heads slowly, one at a time, as they realized that this suicide mission was falling upon the one man they would follow straight into the bowels of the Eye of Terror, the man who had led their regiment for more than three decades since being promoted at age 23, the one man who alone had more awards for valor, more awards for courage, heroism, and defiance in the face of insurmountable odds. Colonel Valois nodded to his commanders once all of their heads had bowed to the obvious conclusion. The more junior officers took longer to realize the gravity of the situation than the more experienced line officers. Lieutenant Colonel Lannes stood up abruptly and looked down the long table at the rest of the officer corp. His steel eyed glare was met by every officer at the table, all ten of them. Each in turn stood, they raised their glasses of Amasec from the table, turned and watched as Colonel Valois slowly stood, raised his glass, and in unison, the roared “For the Emperor! In his Name we Fight!” The meeting broke and as the officers exited the tent, they all knew their solemn duty, to go forth to their respective command and to select the one man by virtue of his training, experience, and tenacity who would be selected to participate in the Colonel’s select band of brothers. For every Imperial Guard Grenadier was like a brother to the others, and they were sworn to step forward to protect the honor of the guard, the honor of the regiment, and the honor of their colonel, all in the name of the Emperor. In the four-thousand years since their founding, the 1st Imperial Guard Grenadiers of New France had never failed to sacrifice themselves upon the altar of victory and in dying, showing by example all of the virtues exemplified by all that they stood for in the defense of the Empire. Thus decided, the officers solemnly marched forth and called their commands to attention. Volunteers were separated, with much difficulty for none of them declined the opportunity to stand forward with their beloved Colonel to serve directly under his command. The selection process took nearly as long as the mission planning and data analysis took. 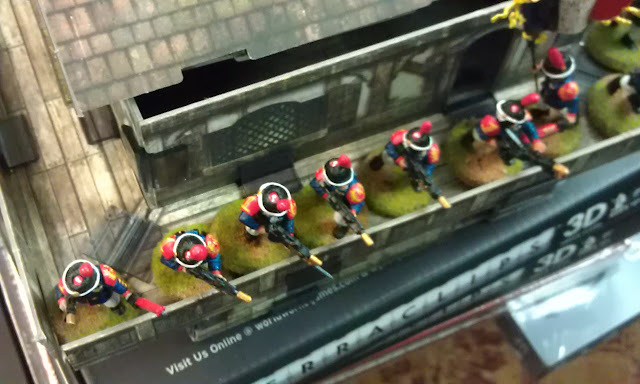 The orders were reviewed over and over, to ferret out any scintilla of why such a mission had been set and why it needed to be carried out by the 1st Imperial Guard Grenadiers. The 13th Dragoons were also stationed in Schtahlnogorsk, they had access to more varieties of vehicles, some of their regiments were equipped with Valkyrie assault ships, which could easily make the round-trip trek to the listening post and return. The only conclusion that the officer corps had come to was that the listening post was but the starting point, and that the surveillance of the jungle paths and the trek through the short span of desert was the real mission, to glean from that trek, slowly and on foot, everything which may be necessary for a major flanking offensive. Their conclusions gave them hope that they were indeed the anvil upon which the rest of the forces would break the enemy upon. The enemy knew that Schtahlnogorsk, a great port city, complete with numerous manufactorums of the Adeptus Mechanicus, turned out war materiel in a virtually endless stream of weapons, munitions, and engines of war. The raw materials mined from the sub-continent were shipped in to the city of Schtahlnogorsk to be forged into weapons of war. The manufactorums of Schtahlnogorsk were renowned in the sector for their quality. The defense of which was given to the most stalwart regiment in the sector, save that of perhaps the Imperial Guard Chasseurs who were busy engaging the enemy on the far western flank of the front, the active front, not the quiet war, the slow war, the war of waiting. Colonel Valois stepped from his tent, his coat of dark blue, capped with red shoulder armor bearing the crest of the 1st Imperial Guard Grenadiers, his head held high and bearing the massive bearskin helmet of his regiment. Officers were permitted to wear a bicorne, it was a symbol of their rank and the importance of their position, but they were rarely worn outside the parade grounds. Colonel Valois wore his bearskin because he did not wish to be identified while they were on their mission as someone other than another soldier in the regiment. His arms and armor were nothing more than that of a simple sergeant, at least on the outside of his armor, his campaign ribbons and official rank were kept in a safe location underneath the breast plate of his carapace armor. The heat and humidity of the air were a sharp distinction from that of the interior of his tent which was conditioned to tolerable temperatures. The assembled officers and select men stood at attention in full uniforms and fully equipped for the task at hand. Several local horses had been procured to transport additional food, munitions, and the heavy radio set which would replace the listening posts equipment, should they be found in-tact. All total there were 9 men, one from each Battalion in the regiment, each of them the best fighting man the regiment had to offer, all were cool-headed, proficient with their weapons, and deadly in performing their sworn duties for the Emperor. Colonel Valois surveyed his team, all of them were indeed the finest fighting men he could ask for, the equal of any space marine in their marksmanship, and unflaggingly loyal to their duty to the Imperium. Gunnery Sergeant Kregor Eisenman and his gunner assistant, Anhkyar Dragovich carried their man-portable lascannon and battery paks with casual ease unlike other teams which sometimes strained at the 125 kg weight of the gear they carried between them. They had been chosen not for their role as an anti-armor detachment, but as long range sniper support. Gunnery Sergeant Eisenman was known to have killed an Ork warlord at 4,000 meters from atop a building in the Crucis Incursion by the Ork Waaaagh! Led by Warboss Skullsmasha and narrowly stopped at the battle of the Crucis gates. Warboss Skullsmasha had sent one of his trusted Nob’s to flank the Hivecity Crucis and just as he was about to signal the assault, Gunnery Sergeant Eisenman fired a fateful shot which halted the offensive and gave the forces of the Imperium a bit of breathing room, long enough to send forth the might of the 1st Imperial Guard Grenadiers flanked by the armored might of the Imperial Guard Cuirassiers complete with their entire regiment of Lehman Rus tanks and Chimera armored personnel carriers. Gunnery Sergeant Eisenman looked like he always did, grim, determined to insure that he survived the mission along with the rest of those with him. He had a reputation to uphold, his platoon had never lost a combat, and never failed to take down their targets as ordered. It was his badge of honor to serve his Colonel this one last time. His only hope was that his death would not be forgotten, that the mission was successful, and that his beloved Colonel survived to provide his report. Gunnery Sergeants Emil Poshkrow and Andre d’Hinson stood carrying their custom modified plasma guns, they were reknown for their ability to literally pick off an enemy target at extreme range and to put forth a veritable wall of plasma in close quarters. They were grinning from ear to ear knowing that they had both made it onto this elite team, now they could put their skills to a true test, each trying to out gun the other before the best judge they could ask for, their Colonel. Sergeant Connor Totenkopf stood at attention, his gleaming bayonet polished to a mirror finish atop his rifle. His bearskin cocked to one side, the furrow on his brow indicating he was deep in thought about how to best protect that which it seemed the Emperor himself had placed into his hands. Sergeant Totenkopf had petitioned to enlist in the1st Imperial Guard Grenadiers when he was a private in the 57th Regiment d’Ligne of New France, shortly after his first campaign. His Colonel had laughed in his face and his first sergeant had spat on the ground at his boots when he found out that he had applied. However, both stood aside when Colonel Valois stepped into the barracks to meet with him privately, as was the custom. Each soldier who had joined the 1st Imperial Guard Grenadiers had been hand-picked by Colonel Valois or the prior Colonel. No one was recruited directly into the 1st Imperial Guard Grenadiers, none were deemed worthy of belonging until they had survived their first campaign. Only those foolhardy enough to want to serve longer petitioned for entry into the guard grenadiers, and only one in a thousand were given an audience with the colonel, and only a few were deemed worthy of being selected to enter the guard grenadier’s training program, with fewer still passing the rigorous testing. Sergeant Totenkopf was one of those lucky few who was admitted and passed the training programs all before he was 20 years old. He was 21 years old now and had five campaigns under his belt. He had personally led a bayonet charge into an enemy bunker and slain every occupant of the bunker as the rest of his squad had been killed, wounded, or provided covering fire for his reckless charge. He was promoted to Sergeant shortly thereafter. Sergeant Gordon Haakonnenson stood beside him, as the regimental bayonet drill instructor, his position was well know within the regiment and attempts to remove him through contests of arms from participating had met with dismal failure and several nasty puncture wounds to several opponents who challenged him. The regimental medicae, Major Richard Burns stood at attention holding the regimental flag, his medicae pack on his back. Major Burns was not only one of the best combat surgeons in the regiment, he was also known as a qualified duelist, no one challenged him to take his spot once he volunteered, for they knew that to challenge him was to invite near certain death. Joining them were Privates Joachim Le’ Datic and Semag Chelnikov, both the successful candidates in the massed brawl in their units to make the team. Both were smart, well-trained, and willing to die for their Colonel and the Emperor. Colonel Valois had checked the reports on each member of his Special Operations Group, indeed, he could not have chosen better had he selected them himself. His officer corp had done an excellent job at finding those most qualified for their mission. Each member, save Chelnikov, had more than 4 campaigns under their belt, all of them had been decorated for bravery, some were even more decorated than some of his superior officers in that regard, but they had chosen to remain in the ranks rather that assume commands above their abilities. Qualities he regarded with the utmost respect, for to know where one could serve the Emperor best is a quality often over-looked in many regiments in the Imperial Guard. The group stood at attention for a brief period as Colonel Valois handed over his ceremonial sword of command to his chosen successor, Lieutenant Colonel Lannes. Lannes would make a good Colonel, perhaps the greatest the 1st Imperial Guard Grenadiers had ever known, for he was merely 30 years old and had been promoted so swiftly based upon his abilities that he was the youngest Lieutenant Colonel in the regiment set aside that of Colonel Valois himself. After the brief ceremony, command had transferred to Lieutenant Colonel Lannes, who became the acting Colonel. With a turn, Colonel Valois turned and took command of his special operations group and they marched out from the line of bunkers across the minefields and a landscape designed to destroy any enemy which marched into it. The column slowly faded into the distance and out of sight when they entered the jungle proper, the banner waiving high as if in defiance of anything or anyone who opposed their progress. A shot of the whole troop that I've gotten done thus far. I have yet to complete the Heavy Weapons team which will be substituting for one or two of the guardsment present in this grouping. 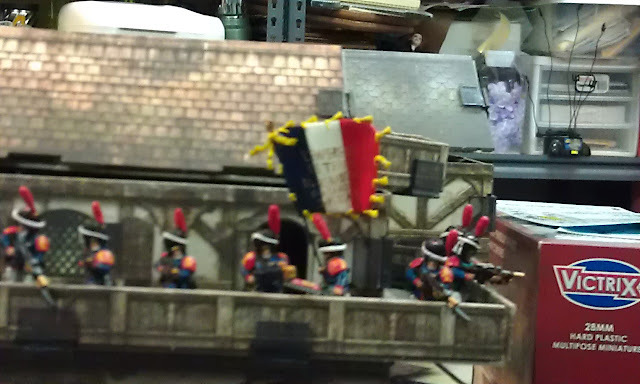 The flat game from the Empire army box from the fantasy series of troops - but it looks good here, sorry for the blur, but my camera phone does not like to do close-ups and digging out the good camera at this late hour was not an option! Sorry! A view from above as the troopers are standing on one of the Malifaux buildings, I've sculpted the bearskins onto the heads of each of these Imperial Guardsmen to create the Imperial Guard Grenadier look to them, they are unique and have a unique paint scheme too. 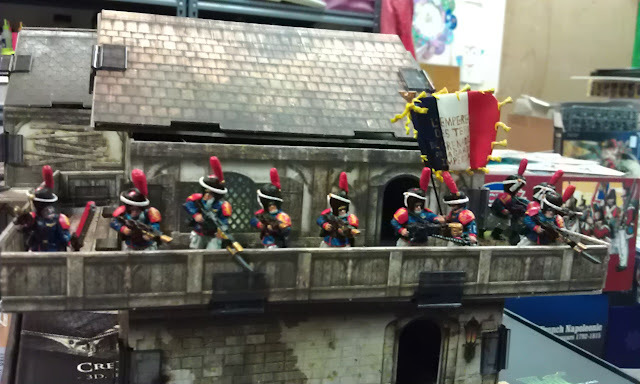 I've purchased lots of French and British troops from Victrix and Perry to start some Napoleonic Skirmish gaming, and I will probably use them in my non-sanctioned event games as my Imperial Guard army and will let my son use the regular Imperial Guard figures we have for his army. A better close up view of the work on these troopers, remember this isn't a command squad or anything, these will be the "regular troopers" in my army eventually when I get them done. The Bearskins are sculpted from greenstuff and brass rod right on to the head/helm of the standard Cadian heads. I might break out the Canon Eos with the Macro lens to get some good close ups, but these work fine for a quick blog post! A nice profile shot showing off the detailed emblems on each of their shoulder pads - an Imperial "N" surrounded by a wreath, which I thought fitting. The N in this case stands for New France (and secretly Napoleon!) in my sector of the Warhammer 40K universe. I hope you enjoyed the short story and background of this unfortunate lot of souls being sent forth to their doom (I played this squad as constructed without the Lascannon team and a few other odds and ends, and they died and routed off the board against Tau, but not without inflicting some serious losses!). If I remember to take photos at the tournament next week, I will see about posting them! Wow, just wow. That is a really neat conversion. Get you some Praetorians and do it again. Awesome! Thanks guys. The conversion is actually very simple, but it sure adds loads of character to the models and makes them distinct from other Imperial Guard armies!